Alaska leads the nation per capita for Farmers Market growth. You can find a Famers Market in almost every region of our state. Many stores and retailers supply Alaska Grown products year-round. Find a store location where you can get these products and support the local agriculture industry. There are farmers, growers, and producers all over the state of Alaska. Find out more information on their locations and what they provide. We are very excited to unveil a price list for the most often requested marketing supplies! One thing we don’t know is what the demand will look like, so we are asking for your patience as we learn more. 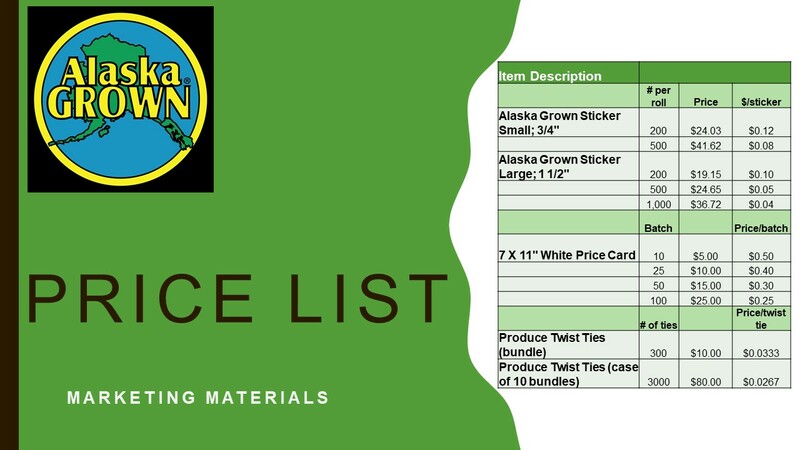 We are very thankful for all the input we have received and the enthusiasm we hear for supporting the Alaska Grown program by paying for marketing resources.